Welcome to our archery section, we have a wide variety of archery and crossbow items. We have longbows, short bows, kid's archery sets, crossbows, medieval arrowheads, fantasy bows, rustic bows and historic arrowheads. We have horse bows, medieval longbows, Turkish bows, yellow osage horse bows, custom longbows, Saxon longbows, recurve bows, Roman arrow shafts, bowstrings and bow bags. Come in and take a look at are large selection of our Medieval Archery and Crossbow items. We just have too many to mention them all. 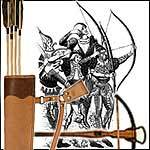 Leather Quivers and Accessories for Primitive and Modern Archery, Bracers and Finger Guards, and Bow Bags. Children's Bows, Arrows and Archery accessories for your beginning archer.